Your Deadnauts are nothing without their equipment. 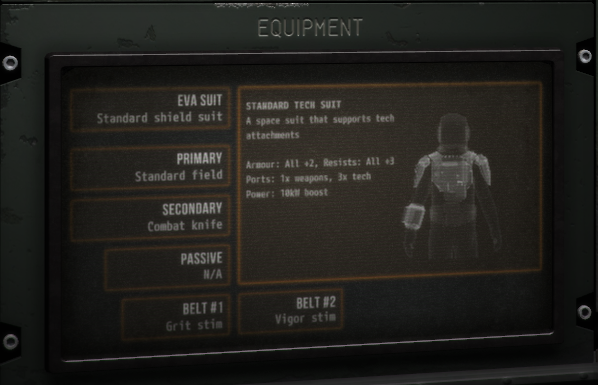 There are five types equippable items: suits, primary, sidearm, passive and belt. Everything depends on the Deadnaut's suit. They provide basic protection, a supply of regenerating power, and they determine what kinds of items can be equipped. There are four kinds of attachment ports. When equipping an item, you'll have to make sure you have enough available ports. A primary item is anything the Deadnaut can actively use, such as a weapon, an active sensor, a hacking tool or a defensive field. When a primary is used, it often requires active power. It can only be used if the suit's power level can afford the power burst. All Deadnauts should have a sidearm and all suits have at least one Weapons port to allow for it. A sidearm is only used if a Deadnaut does not have a primary weapon, or if the Deadnaut is engaged in melee and they have a melee weapon in the sidearm slot. Deadnauts without a melee weapon will be unable to attack when in close-quarters combat. Passive items are always active and draw baseline passive power from the suit. Passive items typically provide some kind of minor bonus, such as a shield or a passive sensor. Stimulants can be equipped in one or two belt slots. 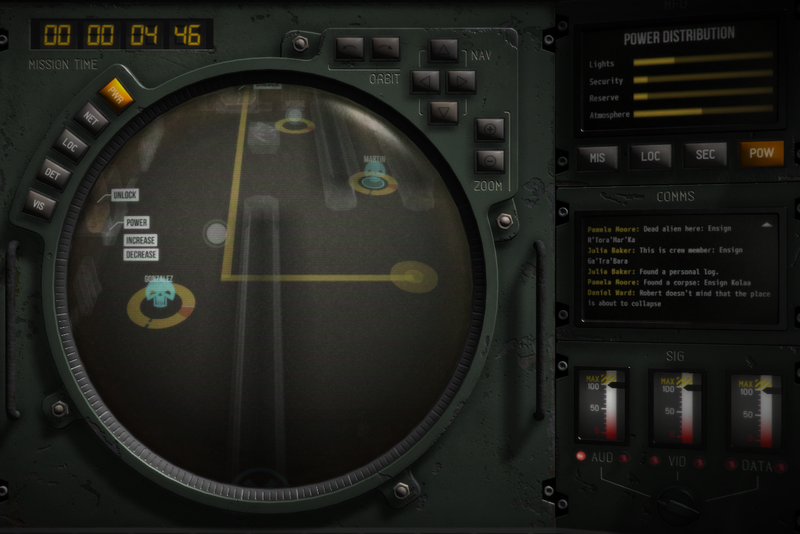 Stimulants are activated by clicking on them during a mission. Most equipment requires power to operate. Some require passive power, such as a shield. Passive power is used constantly. Others, such as active sensors, fields and some weapons, use active power, which eats into the suit's available power when used. This means a Deadnaut may need to wait for their suit to recharge before using their equipment again. You can influence the recharge rate of your Deadnauts' suits in two ways. First, you can equip a recharger in a passive slot. Second, you can increase the amount of power flowing into the room. Your Deadnaut will then tap into the power and recharge at a faster rate. To boost power, first you need to map out the room's power circuit. One of the rooms on the circuit will have a power controller. Boosting this will boost all rooms on the circuit, but be warned: it will decrease the power available on all other circuits. Remember also that even though you're boosting power to a room, the ship may not be directing a lot of power into the Reserve subsystem, meaning it won't have much of an effect. You can always check the ship's overall power distribution before or during the mission via the Database and the MFD.